As with the gold spot price, silver too ended last week’s trading session as a narrow spread down candle on the weekly silver chart, with the price action sandwiched between the 9 and 14 week moving averages to the upside and the 40 week moving average to the downside. 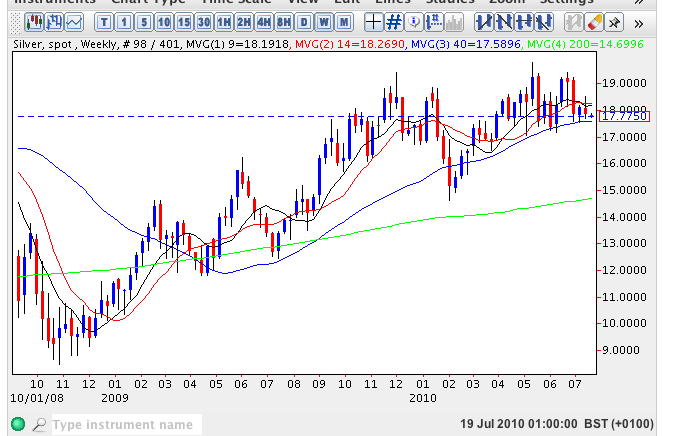 As such there is little we can glean from an analysis of the weekly silver chart regarding the longer term trend for silver at present, other than to note the strong support being provided by the 40 week moving average which was evidenced in the candles of both 2 weeks and 3 weeks ago. For any continuation of the longer term bullish trend we initially need to see a break and hold above $19.23 per ounce followed by a move towards $19.81 which should then open the way for an attack on the psychological $20 an ounce in due course. Like gold the longer term outlook for spot silver remains firmly bullish and once the above price levels have been achieved then expect spot silver prices to continue trending higher.